Unless you are about to depart for the Virgin Islands, live in Hawaii, or earn your living as a snow truck driver, I highly recommend you shut down your Facebook feed. The current onslaught of warm-weather vacation photos being posted by extended acquaintances can be a little demoralizing. Dear wife of the guy (James? John?) who took me to freshman homecoming: I envy your tan. Also, we’ve never met. 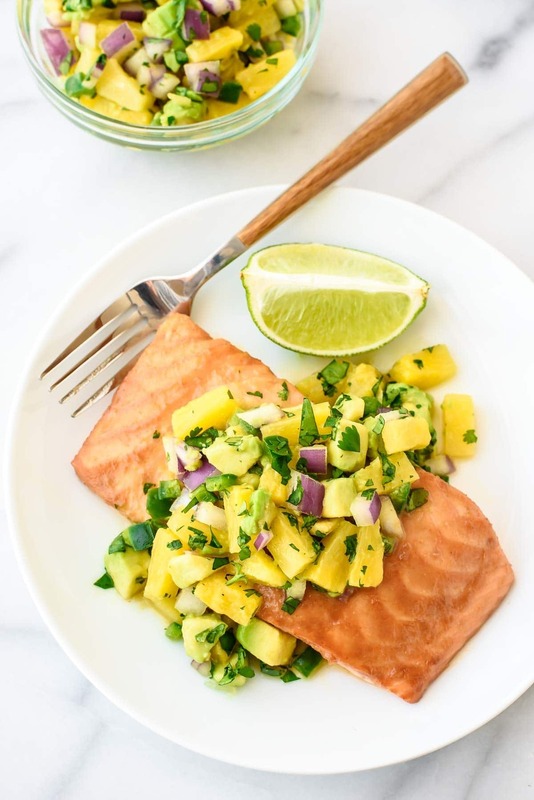 I could become bitter, but instead I’m fighting back and updating my status with a giant photo of today’s Pineapple Glazed Salmon with Avocado Salsa. It’s a beach vacation in every bite! As I shared in my monthly newsletter, Ben and I responsibly resolved to resist the siren call of Mexico and save our vacation days for a longer trip this fall. It seemed like a smart decision at the time, though as I sit and type this with wool socks on my feet, a space heater inches from my torso, and a weather app telling me it’s a “feels like” of negative five outside right now, I can’t help but question our judgment. Fortunately, for those of us in landlocked states near and far, enjoying a taste of the tropics doesn’t require a plane ticket or suntan lotion. 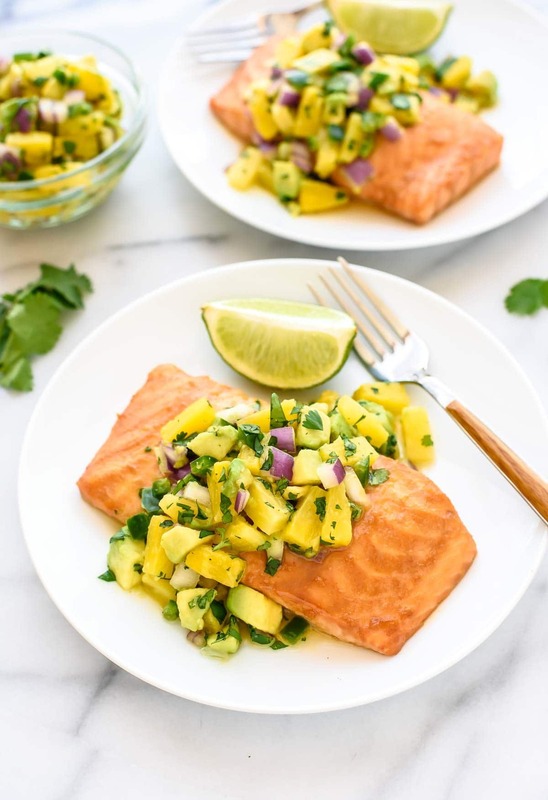 Today’s recipe for Pineapple Glazed Salmon with Avocado Salsa is refreshing, simple to make, and bursting with beachy flavor. The marinade for the salmon is a beautiful balance of sweet and savory: pineapple juice, soy sauce, and a little cayenne for kick. It also does double duty. Once the salmon has chilled in the marinade long enough for the flavors to become friendly and take hold, it’s reduced into a sweet, sticky sauce for brushing over the salmon as it bakes. The result is tender, flakey pineapple salmon with a gorgeous glaze and big-time tropical taste. 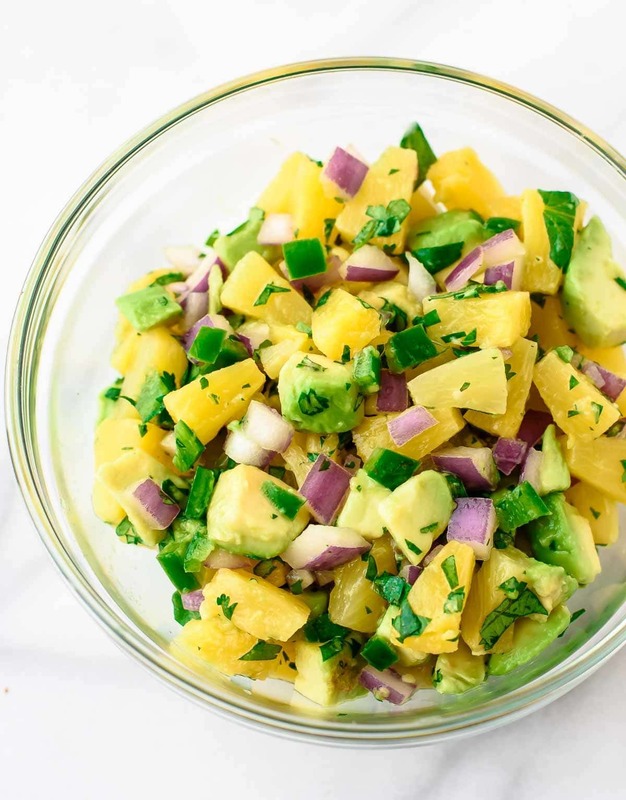 The pineapple avocado salsa is good enough to eat on its own with chips. Combined with the Pineapple Glazed Salmon, however, it tricked my brain into believing that we really were in Mexico—at least until it came time to do dishes. Maybe it was one too many bites of the Pineapple Glazed Salmon (or maybe it was the aforementioned “feels like” of negative five), but a few days ago, I lost my resolve to stay put in Wisconsin all winter and spontaneously booked Ben and myself a short trip to Charleston, South Carolina. Although I won’t be basking on a beach, I’m looking forward to leaving my puffy coat at home and taking advantage of the fresh oysters and southern hospitality. We leave soon, so if you have any recommendations, I’d love to hear them! 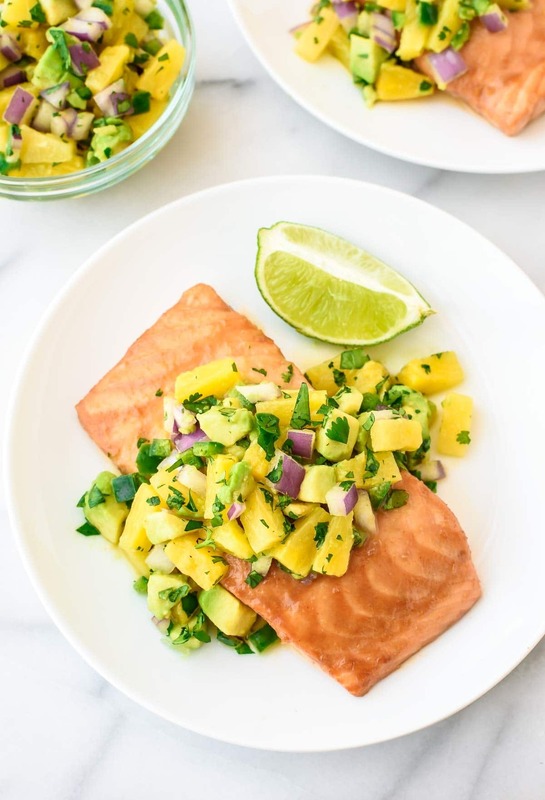 In the meantime, here’s my recommendation to you: ignore the temperature outside, put an umbrella in your drink, and make this Pineapple Glazed Salmon with Avocado Salsa. A little Beach Boys/Johnny Buffet background music will seal the mood. Whether it’s for a romantic date night affair (Psssst boys, Valentine’s Day is this weekend) or casual Tuesday night dinner, this Pineapple Glazed Salmon is the perfect way to escape the business of the week and take a vacation without leaving your kitchen. A colorful, healthy recipe for salmon brushed with pineapple glaze. Fabulous on its own, and the pineapple avocado salsa puts it over the top! Place the salmon fillets in a small shallow baking dish. In a small bowl, stir together the pineapple juice, soy sauce, garlic, and cayenne pepper. Pour over the fish, cover tightly with plastic, then refrigerate for 2 hours or overnight. 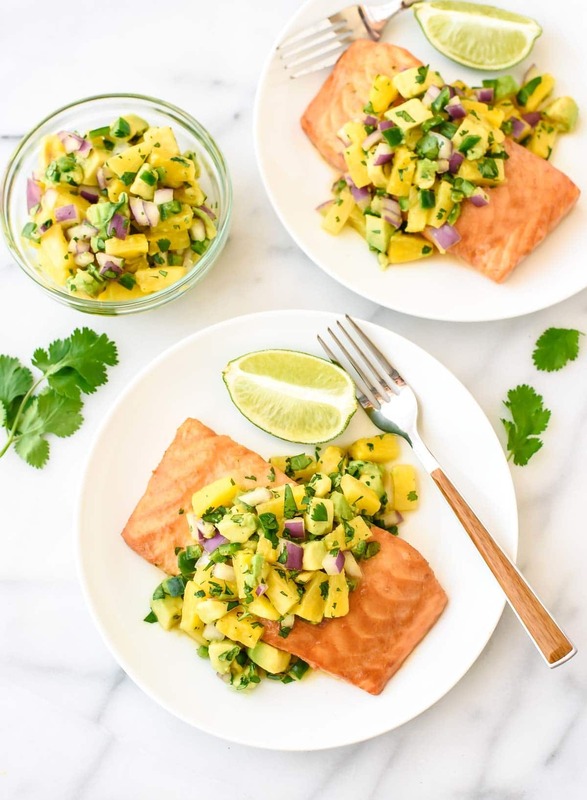 While the salmon marinades, prepare the salsa: Combine the pineapple tidbits, avocado, jalapeno, red onion, cilantro, and salt in a small mixing bowl. Pour lime juice over the top, then toss gently to coat. Refrigerate until ready to serve. When ready to bake, preheat the oven to 400 degrees F. While the oven preheats, remove the fish from the refrigerator. Line a baking sheet with aluminum foil, then coat with non-stick cooking spray. Remove the salmon from the marinade, shake of any excess, then place the salmon flat-side down on the prepared baking sheet. Transfer the marinade to a medium saucepan. Simmer over medium high, stirring often, until the marinade is reduced by half, about 6 minutes. Brush liberally all over the top of the salmon. Bake the salmon for 5 minutes, brush again, then bake an additional 5 to 10 minutes, until the fish flakes easily with a fork. Serve topped with pineapple salsa. OH YUM! This looks so dreamy. Love the idea of taking a vacation inside the home! :) This dish is the perfect one to do that with and feel good afterwards as well! This sounds soooo good right now. Also – Charleston is super fun. I was there for a day back in July and we hit up a lot of great spots. I have a little recap with some recommendations in this post: http://cakeoversteak.com/things-im-loving-july-2015/ Have fun! Thanks Sara!! I’ve heard great things about many of these, and Jeni’s is a must! hey girl this looks really good! I hope y’all enjoy your trip. I would love to go to S Carolina!! Have fun! This looks so bright and cheery! I’m glad to know that this can be made with canned pineapple, since one of the culinary skills I have completely failed to acquire is how to cut up a pineapple (despite the many online videos). I hope you have a great time in South Carolina! Thank you Erin for the nice recipe. Have a great weekend! I’m new to your blog and really loving it. WELCOME CRYSTAL!!! I’m so happy to have you here. Thanks for saying hi! One of my all-time favorite recipes ever ever. MM. Erin, I made this (and no, didn’t take a picture, sorry) and it was wonderful. I happened to have fresh pineapple and used that, so good. Thanks for a great recipe! I really enjoy receiving your recipes and your chatty, newsy, writing. YAY Beverly! I’m so so sooo exited to hear this! Thanks for sharing your review and for your kind words about my writing too. It means a lot! This was INCREDIBLY Delicious! It just might be my new favorite Salmon recipe. And the Salsa can stand on its own for a savory side dish or treat. Sarah, I’m happy to hear you love it! Thanks for taking the time to report back!